If you need to cut out an object, or modify only part of an image, then the selection tools are just the ticket. This is one of the most common editing actions, so it’s important to know which individual tool is best for your needs. Whether you want to change the color of someone’s shirt, or move a flowerpot to the other edge of the frame, selection tools are crucial in getting the job done! So what is Quick Selection and when should you use it? It’s easy if you think of this tool as sort of a hybrid: a cross between the Magic Wand and the Selection Brush. Quick Selection does “see” tone, color, and texture (like the Magic Wand), but also allows you to control it with your pen strokes (like the Selection Brush). If you have an object that is similar in color or texture and you’re not 110% rock solid with your fine mousing skills, then Quick Selection may be just the tool for you. Hardness: Controls the tightness and “severity” of the brush edges. Harder = more crisp, clean lines. Softer = more fuzzy, blurred lines. Spacing: Controls how many selection points are dropped while you drag your brush over a set of pixels (kind of like anchor points). Low spacing = uninterrupted brush line. High spacing = selected dots along brush line. Roundness: Controls the shape of your brush head. 100% = your brush is perfectly round, as indicated by the diagram. 50% = your brush is oblong. 0% = your brush is a thin flat line. Size: This allows you to change the size of your brush by pen pressure or stylus wheel. Great if you do your editing on a tablet or similar device. Now let’s say I just wanted to select the orange elephant. First I’d need to flatten my image, or condense my layers. I can do this from my top Main Menu > Layer > Flatten Image. Now my selection is ready to be added to another image or simply refined further. 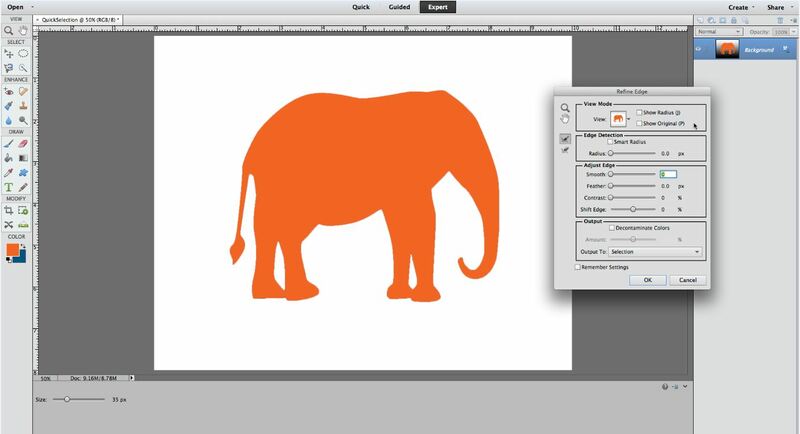 If I wanted to superimpose my elephant onto a photo of the African savanna, I can! It would be a bit silly, but you get the idea. If you’ve used this tool to cut out a photo of your aunt who was absent at this year’s family reunion, now she’s ready to be added to the group shot. Or if you’ve selected a great photo of your dog, he’s ready to be added to your cheesy holiday card template. Overall, the Quick Selection is exactly what it seems: quick and straightforward. It’s yet another smart implement in the selection toolbox and is sure to make your editing life easier! Stay tuned for next time when we wrap up the Photoshop Selection Tool series with our Marquee tutorial!